And so we meet again Nikon Coolpix circa 2006. Until I get my DSLR back I'm going to be using this camera. On the bright side, its light to carry over the snow. Today I ran errands: dropped off thrifted clothes to be altered and looked for a new pair of shoes for work. You know how when cheesy people say, "When it rains, its pours?" Its true. My car broke too. This is what I get for getting an absurdly low Honda. Ah well. The first outfit felt really boring after I ran errands so I changed into my cozier second one. This sweater was my mom's in college and is incredibly cozy and warm. Perfect for sitting in bed eating mac and cheese watching Gilmore Girls until I go out tonight. how lovely. the sweater on top of the dress is such an wonderful idea. adore the sweater, the pattern is so brilliant! that sweater is working it! i love it against the snow - you make me want to give winter a hug and a cup of cocoa. Sorry 'bout the car. The outfits are very cute. I've been loving "The Gilmore Girls" since the show first started. I told all my friends about it; they ignored me; and then they saw one episode and got equally hooked. I finally felt vindicated. I think the pictures look great... but then I'm a big believer in not necessarily needing a posh camera to take good pictures. Love the sweater... I always steal from my mom too when I'm at home! Both outfits look so cute and cozy, but the second one is the winner, I love it! I love your sweater from 7th grade...haha that's awesome!! you're always super cute, but the second outfit is so so sweet! that second sweater is hot tamales. i want it! Your pics still look fab even without your DSLR. I love Zara's post holiday sale...everything is the same price you would get it at F21! oh no to broken car. That dress is so cute and I love how you kind of wore it as a skirt! Oh, that is so true. When it rains, it really pours. Cliche but true. Point and shoots are really light to carry compared with dslr's. I love the pockets in the skirt. You have so much snow!! Both those sweaters look great with this dress. I love the tights you're wearing in your first outfit. Wishing you a loooooong streak of good luck! wow! 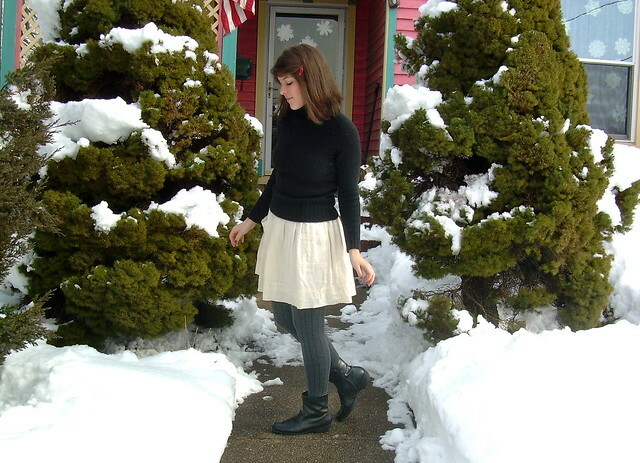 !you look so good!i love the combination!and i miss snow!! i am following!visit my blog if u like and if it's interesting leave a comment or follow! love the tights you are wearing!